Part two of the celebration of Lao New Year in Luang Prabang. The next day (this year, April 15) is called Mue Nau. This is a special day, which belongs neither to the outgoing year nor to the new year. Nobody should work or sleep during this day. 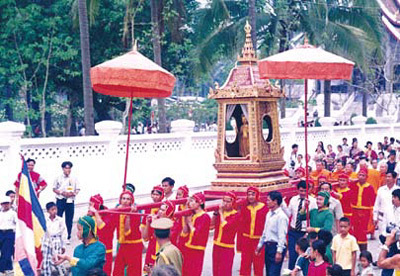 Hae Vor, the Procession of the Palanquins, is now more commonly known as Hae Nang Sangkharn, (Procession of the Goddess of the Year). 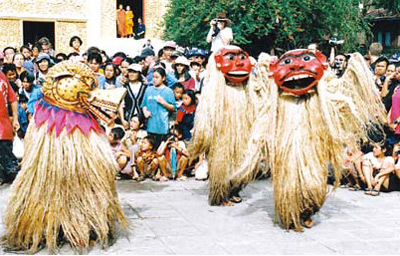 This procession derives from a very old legend, that of Phanya Kabilaphom. The seven daughters of Phanya Kabilaphom symbolise the seven days of the week. Each girl rides her own animal and holds her own regalia. 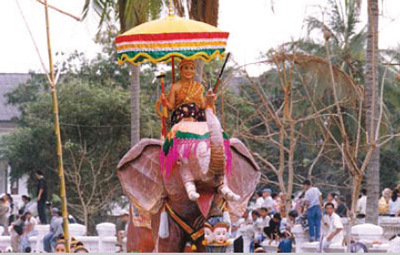 Nang Sangkharn is always the girl representing the last day of the outgoing year. The last day of the year of the Tiger being Thursday (14 April), Thursday girl is Kilini Thevi. She rides an elephant. This year’s animal is the Rabbit. Nang Sangkharn was selected among the most beautiful girls of Luang Prabang in a beauty contest style election involving several stages.